It's been three years since Renault went solo in India and out of those three, 2012 turned out to be the best year for the company. Any guesses why? Well, since the subject of the matter is the car in question, the answer is simple - the Duster. Renault launched the compact SUV with interesting features and an even interesting price point and the customers couldn't keep their hands off it. Duster won several accolades and Renault hasn't looked back since then. The car was sensible, fun to drive, and was powered by an engine that was phenomenally responsive. Renault established itself in India, thanks to this car. 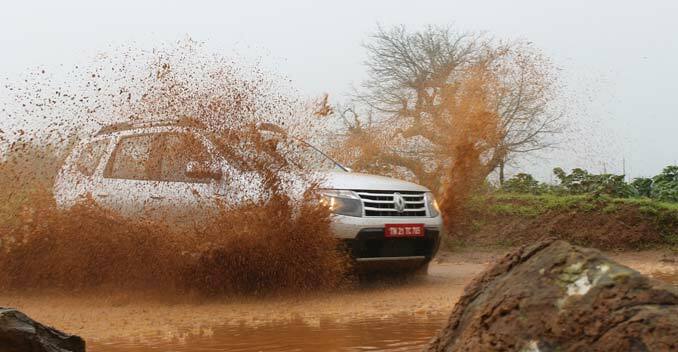 With the Duster's sales crossing the 1 lakh mark, it was only time when there was something new on the horizon. Renault India had proclaimed at Duster's launch that it will bring variations to the car soon, so we expected one of the following two things - a 4x4 version or an automatic transmission. There were the Anniversary and the Adventure editions, but deep down in our hearts, we were convinced that it was the 4x4 and automatic transmission that would do wonders to the car's growth in India. So, after two years of waiting, we finally managed to get our hands on the Duster 4x4 or as Renault calls it, the Duster AWD. Though the car's exteriors doesn't receive a lot changes, Renault has managed to give the Duster AWD a unique set of alterations that sets it apart from the regular car. To begin with, it gets what Renault calls 'Anthracite' alloy wheels, darkened head-lamp clusters and matte black B-pillars on the RxZ trim. Ofcourse, the company was careful enough to give it some AWD badges at the rear, so there's no scope of confusion. Moving on to the car's cabin, it sees a lot more changes, which includes a new three-pod instrument cluster that features an instantaneous fuel consumption meter. There is also a new 3-spoke steering wheel, dual-tone grey and red seats with a new bee-hive design and some soft-touch plastics on the upper portion of the new dual-tone, black and grey dashboard. Though we would have preferred a fully black dashboard, Renault thought it wise to go with a dual-tone finish. One has to agree that there are a fair amount of changes inside the car, a mix and match of both, the new and the old. Space isn't a problem either since there is enough leg- and knee-room in both, the front and rear. Furthermore, the boot gets a capacity worth 410-litres. Now, to talk about what the car is all about - the AWD system. There's the new electronically controlled 4x4 system, which Renault calls the i-Drive Technology. I am guessing your first thought was 'BMW? ', but no, there is no relation. That said, the Duster AWD also receives independent suspension at all four corners. When I first drove the standard Duster, I felt the clutch was slightly heavy, but the one in the AWD feels different. It is comparatively lighter and hence, comfortable to drive. Renault has shortened the gear ratios on the 4x4; especially the first gear, which gives it a significant advantage. You realise how important this is, when you take the car off-road since it is now easier to crawl down steep slopes. Then there is the ESP and Anti-Skid Resistance that helps you get out of slippery conditions. When we drove around the off-road track in Lavasa, the mud was covered with a dense layer of grass and the 215/65 R16 MRF Wanderer tyres had their work cut out, but the ASR and the ESP kicked in just in time to save the day. Even though you slide around a bit, there is absolutely no problem getting out of the rut. Yes, it is a capable off-roader, much like the Skoda Yeti, for that's what Renault compares it to. So, what is the All wheel drive (AWD) all about? First, there are three modes on the AWD selector knob: 2WD, Auto and Lock. While '2WD' keeps it permanently front-wheel driven, 'Auto' sends a part of the power to the rear wheels when the system detects that the front wheels are losing traction. 'Lock', on the other hand, keeps the hardware in 4x4 mode up to around 60Km/h, after which, it shifts back to 'Auto' mode. Coming down to the ground clearance, though it remains unchanged at 210mm, Renault says that the car can wade through 400mm deep water. The electronics inside work well to provide traction to the wheels. What's even more impressive is the fact that the independent rear suspension has improved the ride even further; it's more of a rally-ready car now. That lead us to ask the folks at Renault if there were plans for a factory team that would enter the motorsport scene in India. Though they denied a factory entry, they told us that we would soon see a car cruising at high-speeds through rally stages with backing from the French car manufacturer. The Duster AWD will arrive in India around the festive season and will cost about ₹ 75,000 more than the current top-end Duster. The Duster has always been a great car to drive, but the mechanical changes it has undergone make it even better. It can now off-road and is thus, a step closer to becoming a complete SUV. Well, ofcourse, the badge reengineering between Renault and Nissan will mean that we will also see the Terrano in an AWD avatar. That said, what remains to be seen is who comes out with the CVT transmission first.